SEGY has long been a standard format for storing seismic data and header information. Almost every seismic processing package can read and write seismic data in SEGY format. In the data processing world, however, ASCII format is the "universal" standard format. Very few general-purpose plotting or computation programs will accept data in SEGY format. 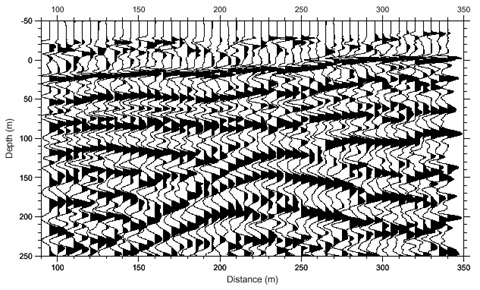 The software presented in this report, referred to as SEGY to ASCII (SAC), converts seismic data written in SEGY format (Barry et al., 1975) to an ASCII data file, and then creates a postscript file of the seismic data using a general plotting package (GMT, Wessel and Smith, 1995). The resulting postscript file may be plotted by any standard postscript plotting program. There are two versions of SAC: one version for plotting a SEGY file that contains a single gather, such as a stacked CDP or migrated section, and a second version for plotting multiple gathers from a SEGY file containing more than one gather, such as a collection of shot gathers. Note that if a SEGY file has multiple gathers, then each gather must have the same number of traces per gather, and each trace must have the same sample interval and number of samples per trace. SAC will read several common standards of SEGY data, including SEGY files with sample values written in either IBM or IEEE floating-point format. In addition, utility programs are present to convert non-standard Seismic Unix (.sux) SEGY files and PASSCAL (.rsy) SEGY files to standard SEGY files. SAC allows complete user control over all plotting parameters including label size and font, tick mark intervals, trace scaling, and the inclusion of a title and descriptive text. SAC shell scripts create a postscript image of the seismic data in vector rather than bitmap format, using GMT's pswiggle command. Although this can produce a very large postscript file, the image quality is generally superior to that of a bitmap image, and commercial programs such as Adobe Illustrator® can manipulate the image more efficiently. This directory contains the source code and shell scripts necessary to convert SEGY files to ASCII format and to create postscript plots, along with a makefile and a README file. This directory also contains a subdirectory with an example SEGY file, ASCII file, shell script file, and resulting postscript file. As a test, one can run the shell script file to recreate the xyz and postscript files. This report supercedes USGS Open-File Report 99-126 that used obsolete C++ code, that will not compile on a newer C++ compiler.